Words. Word a day. Will this post prompt a logomachy or two? I rarely come across British English words in my everyday reading which I do not know, I suppose not surprising as I’ve been an avid reader for much of my life since I was three years old. However, looking up a word – which I’d come across recently – in the on-line Oxford dictionary I found myself subscribing to its ‘word a day‘ service. Fascinating! So far it seems I’m given a word I do not know, or the meaning of which I cannot deduce, about once every five to ten days; sometimes that the word can also be heard spoken is helpful when the pronunciation is not obvious (to me). A recent word the meaning of which could be easily deduced was ‘spiderling‘ – a baby spider – though I’d never heard it before. Today’s word, ‘carlin‘, I’d never met and I hadn’t any idea what it could mean. 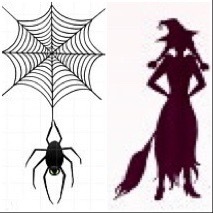 It means ‘witch‘, deriving from Middle English, in turn from Old Norse – ‘kerling’ meaning an old woman. What I find particularly interesting is that the Old Norse word means ‘old woman’, even just ‘woman’ without the supernatural powers. However, so often have old women, especially those bent and wizened, been regarded as witches! Looking at the five words said to be the most popular in the world at the moment, I was surprised to see ‘POV‘ given as the most popular: surely it’s an acronym – ‘point of view’ – which I do not regard as a ‘word’, but maybe I’m out of step here. No surprise to see ‘retweet‘ in second place (one reason I’ve abandoned twitter). Other surprises are ‘lughole‘ though its meaning is well known to tykes like me – ear – though we’d pronounce it “lug’ole”. ‘Alguacil‘ in third place is surprising until you remember that Spanish is becoming the most used language on the planet; I can think of no explanation for ‘cytopenia‘ being in fourth place unless it’s because of frequent use in medical journals as a result of discussions about cancer. For those of you who do not know the Oxford Dictionary service, if you subscribe to it you get an email each day with the ‘word of the day’ and clicking on the word takes you to the definition(s) and pronunciation. It’s not really surprising I had not come across ‘carlin’ as it’s Scottish, not English, but the two words – spiderling and carlin – prompted me to dash off the following bit of doggerel. Cruelly dashing our spiderling’s hope of ever being a web-spin celeb.